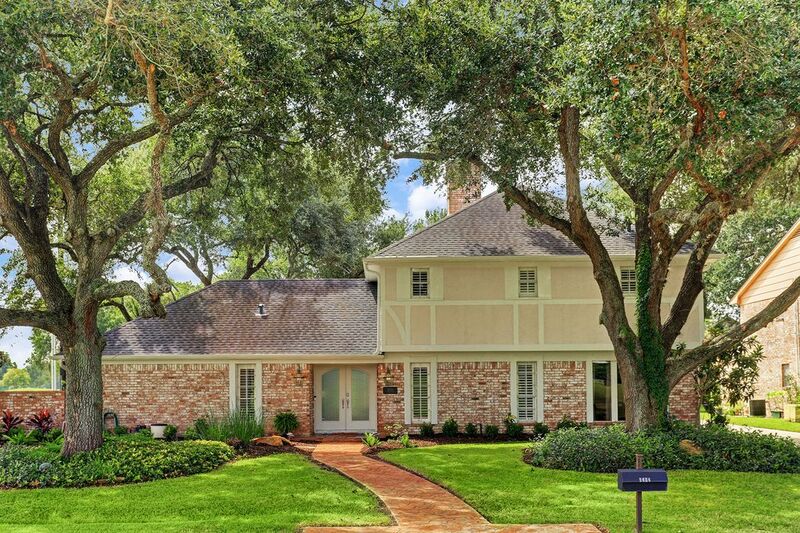 2634 Fairway Drive, Sugar Land, TX 77478 | Martha Turner Sotheby's International Realty, Inc. 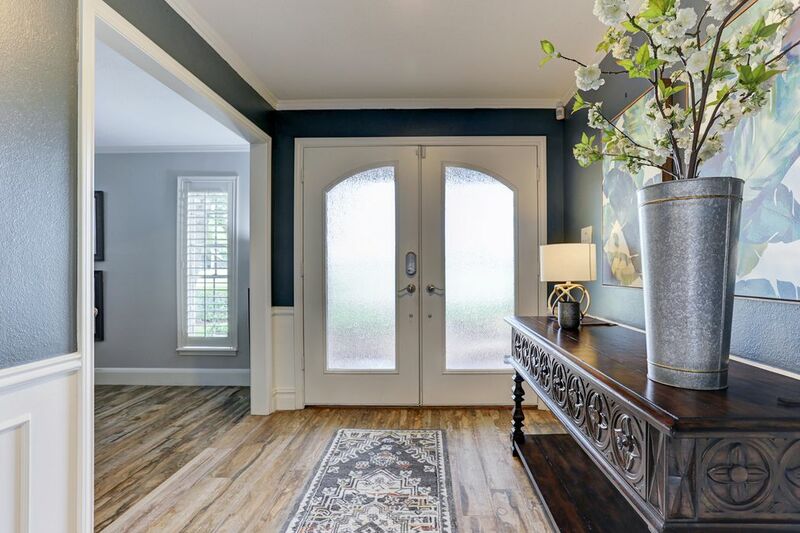 ENTRY Though double doors, visitors are greeted with light filled foyer leading to two story living. 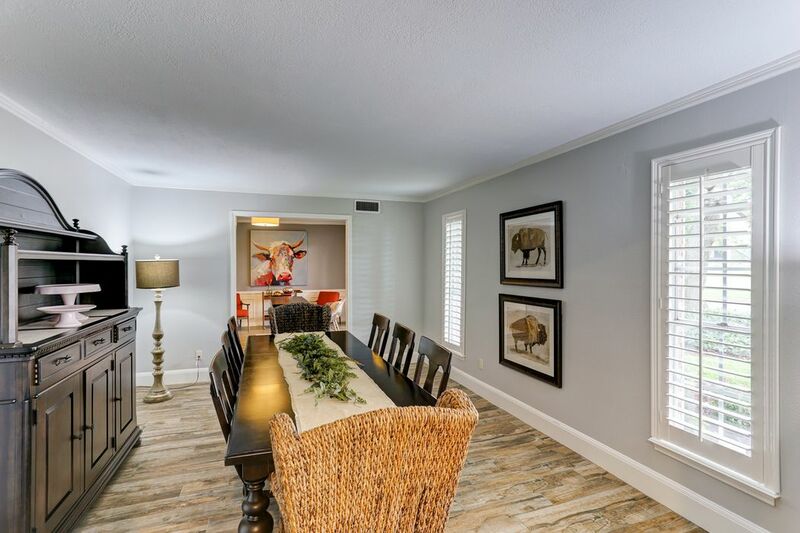 Dining flanks the entry at left. 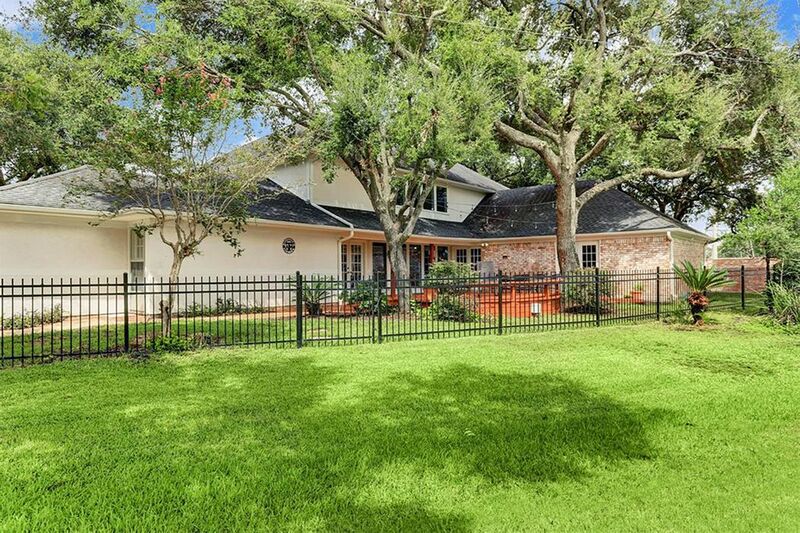 So many special features in this home, including convenient keyless entry at front door. VIEW FROM ENTRY INTO LIVING Noteworthy architectural attributes are evident throughout the home. Soaring ceiling with exposed wooden beams add style. 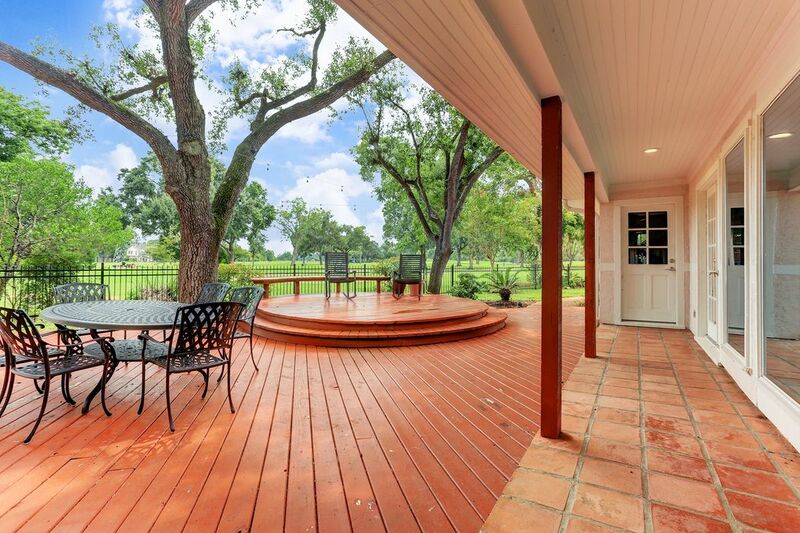 Two sets of French doors leading to covered patio make entertaining a breeze. Recent carpet. KITCHEN Generous updated kitchen boasts stainless steel appliances including double ovens and gas cooktop, pendant lighting and desk nook. 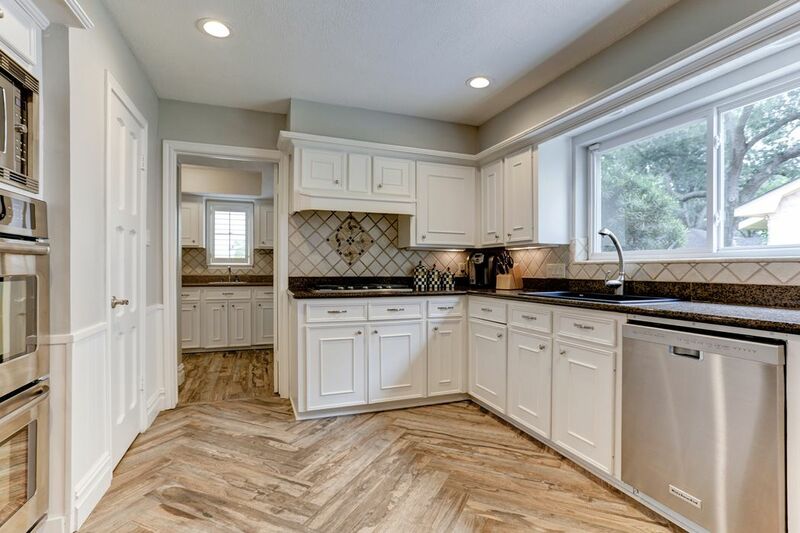 Wood look tile was carried into the kitchen in herringbone design. SUGAR CREEK COUNTRY CLUB GOLF COURSE Lush and manicured are the fairways of acclaimed Sugar Creek Country Club gold course. Enjoy these views round the clock every day of the year. WET BAR Wet bar with lots of counter space and considerable cabinets is found just adjacent to living area with clear view of the television. Perfect for movie watching and game days. French doors at left provide access to patio. SECONDARY BATH Pretty remodeled bath is one of two secondary baths upstairs. 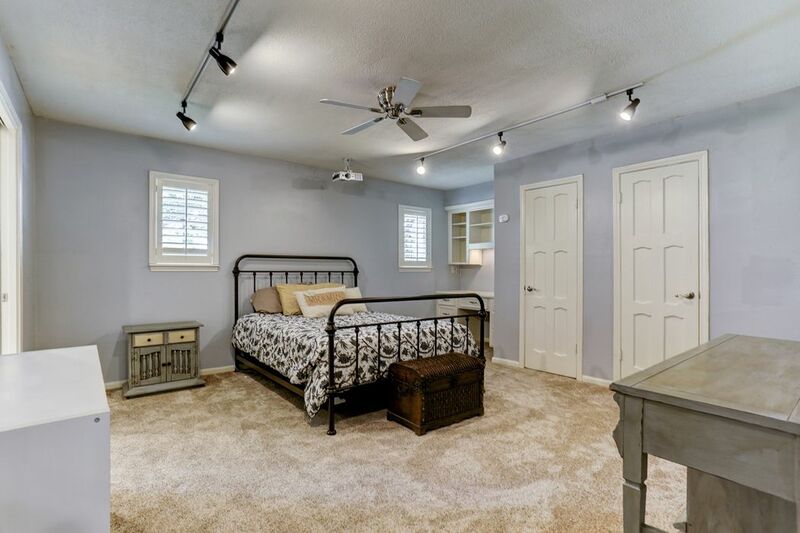 This one adjoins two bedrooms. 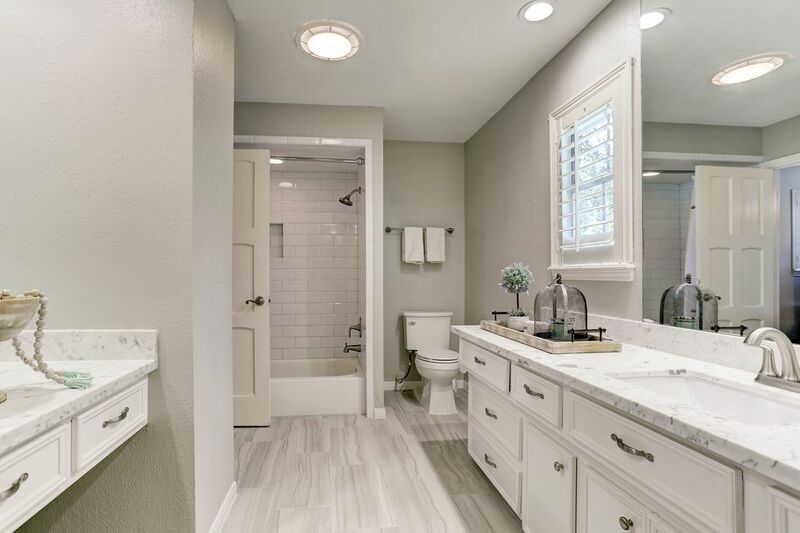 Tastefully designed with recent subway tile shower surround, marble countertops and tile flooring. Please note plantations shutters. Secondary Bathroom Both bathrooms up have been similarly designed with current cool neutral finishes. 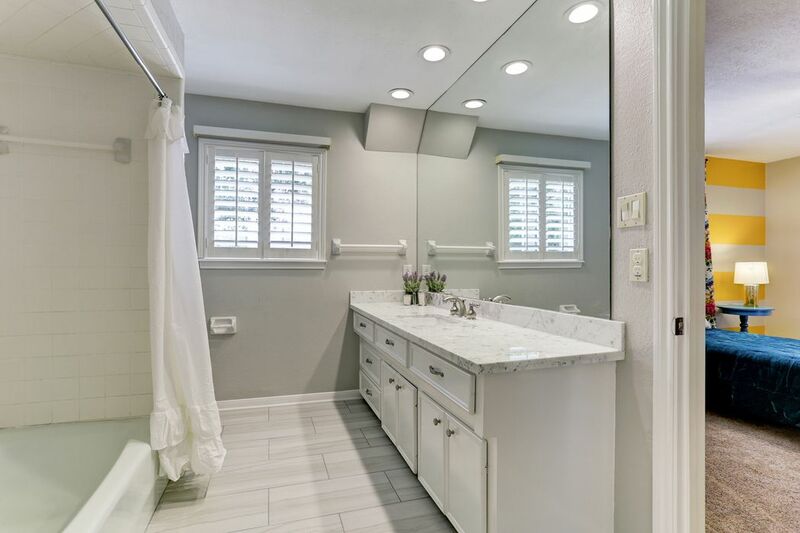 This bathroom is also shared between two bedrooms. DINING ROOM Huge sunken dining room flanks entry. Large enough to easily accommodate seating for eight. More than enough room for hosting Thanksgiving. View of front yard through windows fitted with plantation shutters. ALTERNATE VIEW OF KITCHEN Abundant natural light fills this kitchen. 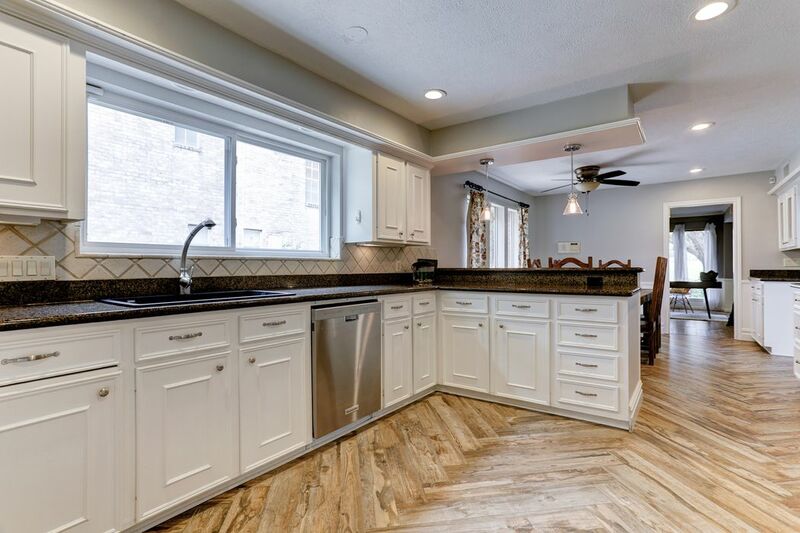 Updated with slab granite counter top, stainless steel appliances and deep sink. Pantry at left. ALTERNATE VIEW OF KITCHEN Kitchen flows into breakfast area which flows into flexible space. 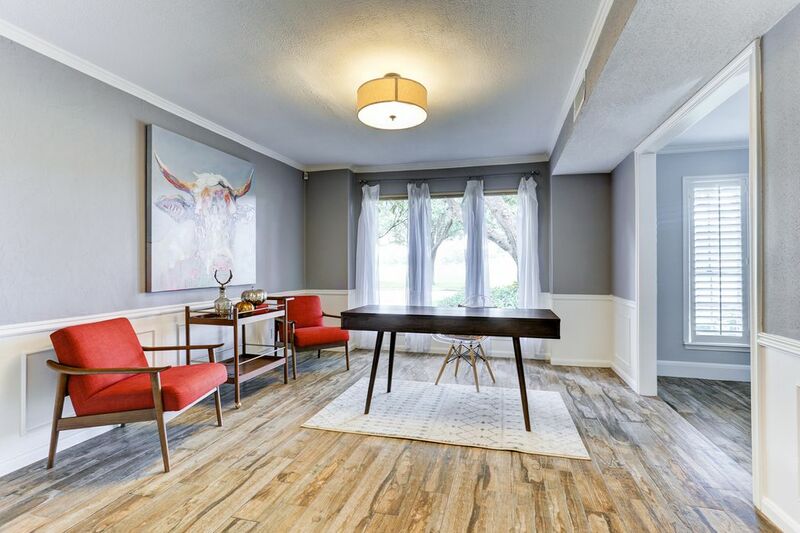 This home features ell appointed floorplan with generous rooms. 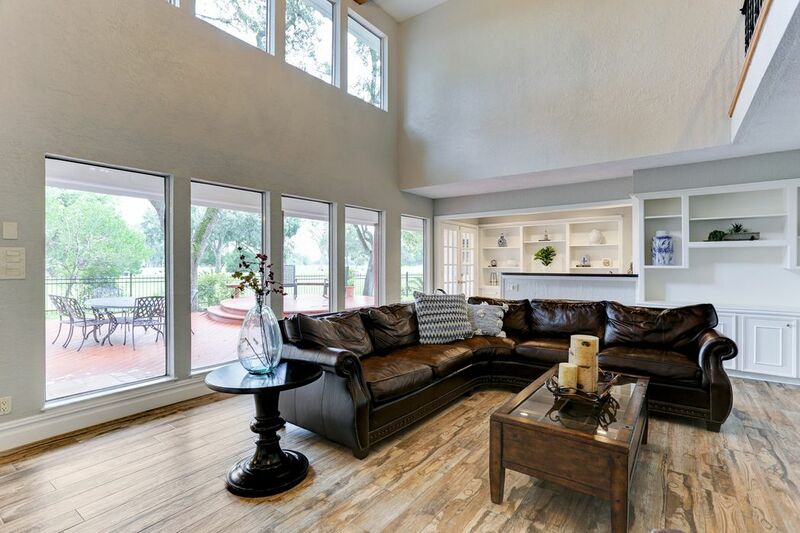 MORNING ROOM Cozy breakfast area enjoys view outdoors through triple floor to ceiling windows. WET BAR This home was built for entertaining. 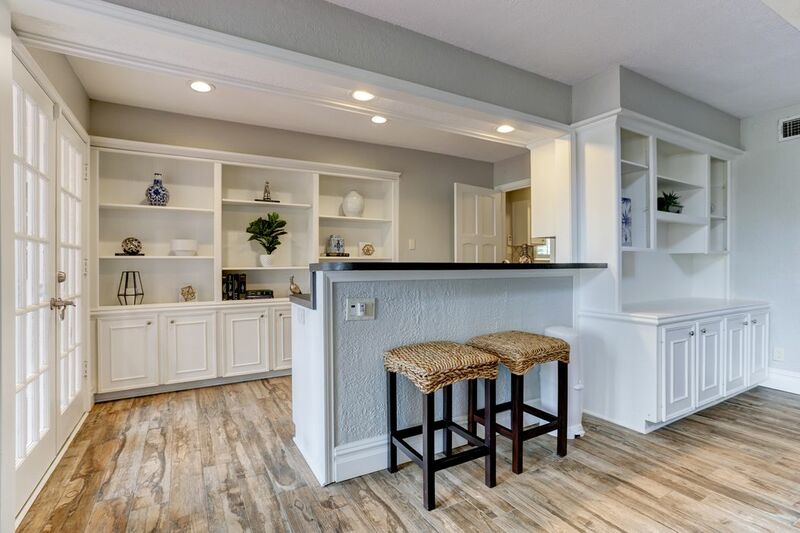 Situated at rear of living area, this space allows guests to snack and make cocktails while never missing a moment of the big game or favorite movie. Seamless wood look tile throughout entire downstairs. 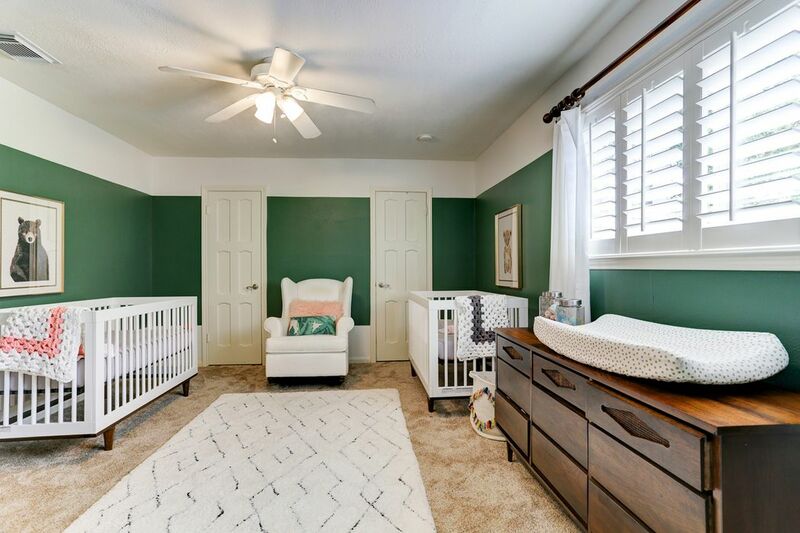 LIVING Fun filled gatherings await in this elegant, yet inviting, family room. 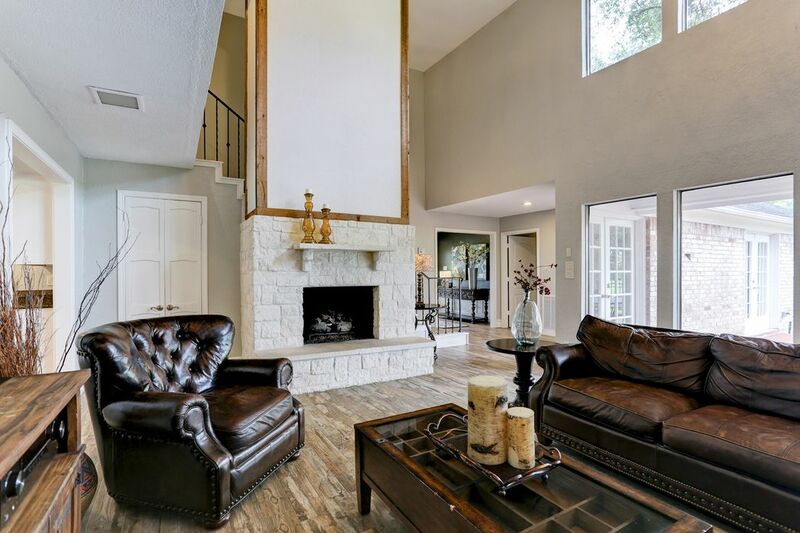 Austin stone fireplace with hearth is a focal point. Green rolling manicured golf course is seen through wall of windows at right. MASTER BEDROOM Located on the first floor, roomy master bedroom has French door access to the patio. Wood look tile flows into the master suite as well. His and hers closets. 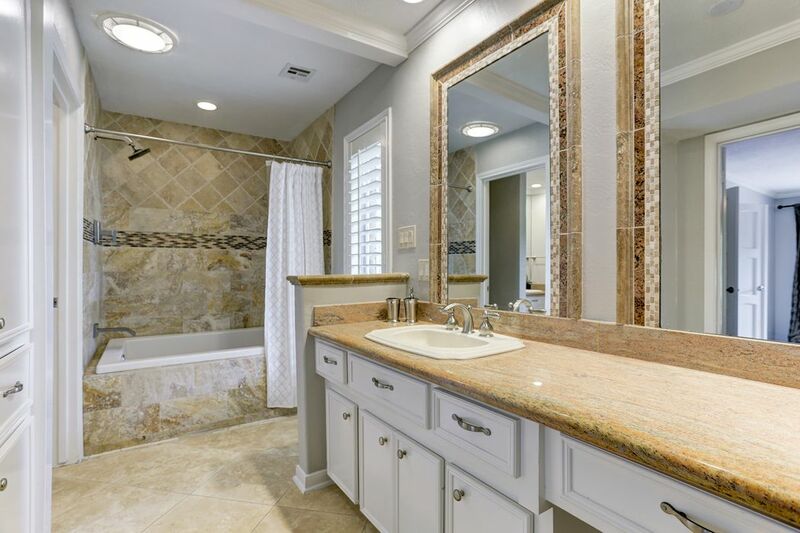 MASTER BATH Master bathroom has been updated with thick slab granite and brushed nickel hardware and accessories. 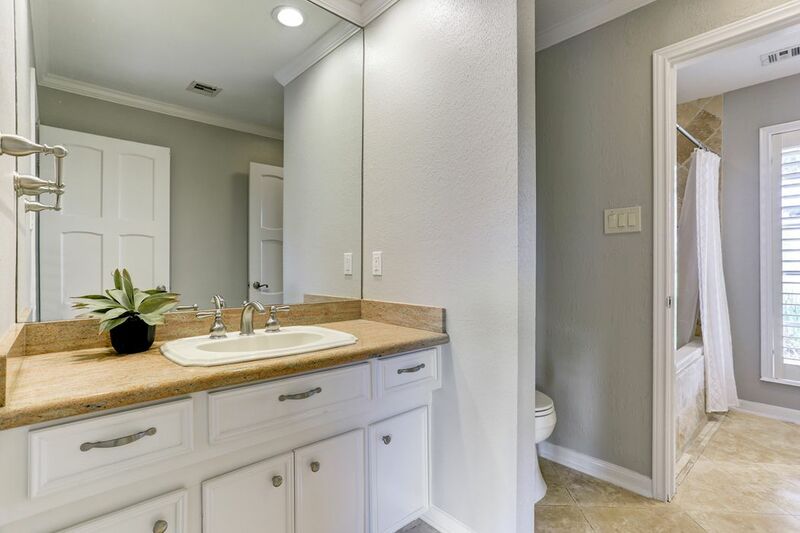 HIS sink is conveniently located away from HER area. MASTER BATH HER area has expansive counter area plus knee space vanity. Deep, soaking tub features high end hardware and rain shower head. Tons of canned upgraded lightening throughout the home. SECONDARY BEDROOM One of four roomy secondary bedrooms up--all with sizable closets. Every bedroom has direct access to a bathroom. Recent carpet throughout the upstairs. SECONDARY BEDROOM This bedroom is located at the top of the stair well. Built in desk nook and shelving. SECONDARY BEDROOM Every room in this home is oversized, larger than average. 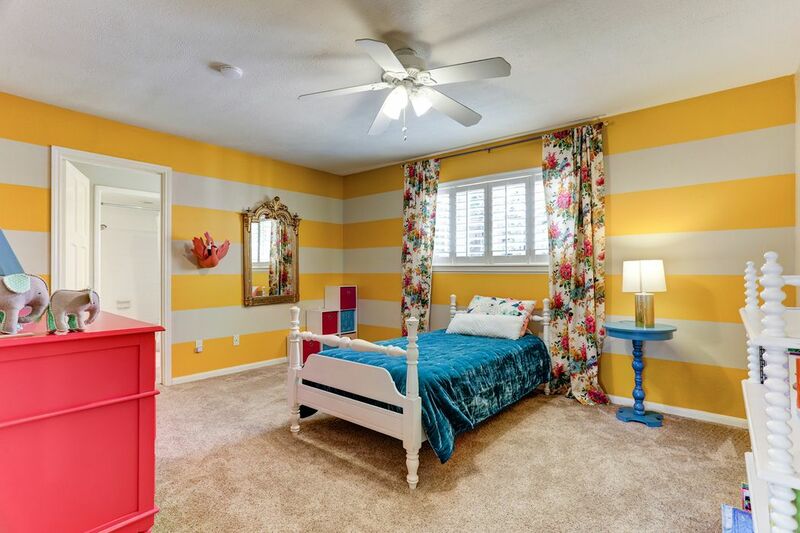 This one is no exception and it features dual closets as well. CAT WALK Access to each of the four secondary bedrooms are along this cat walk. One additional door leads to a large cedar closet. 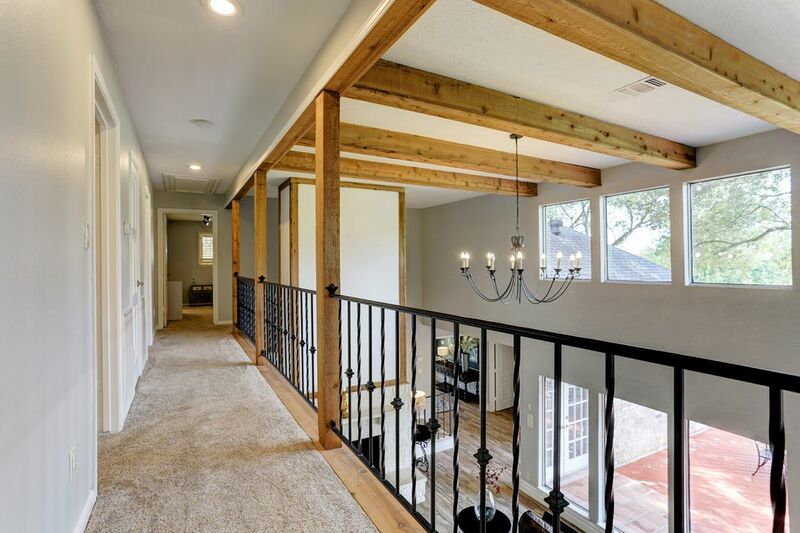 Neutral gray paint, iron railing and exposed wooden beams give a youthful feel to this traditional home. OUTDOOR SPACE Just imagine waking to this view every day. Sipping coffee on a quiet morning for a peaceful moment or invite the whole gang and have a party, you choose. This space lends itself to both. Seventh hole tee box at left. REAR ELEVATION Plenty of green space remains behind the iron fence. UTILY AREA This space is found just inside, upon entering from the garage. Powder bath is at left and separate room for washer and dryer at right (not shown). 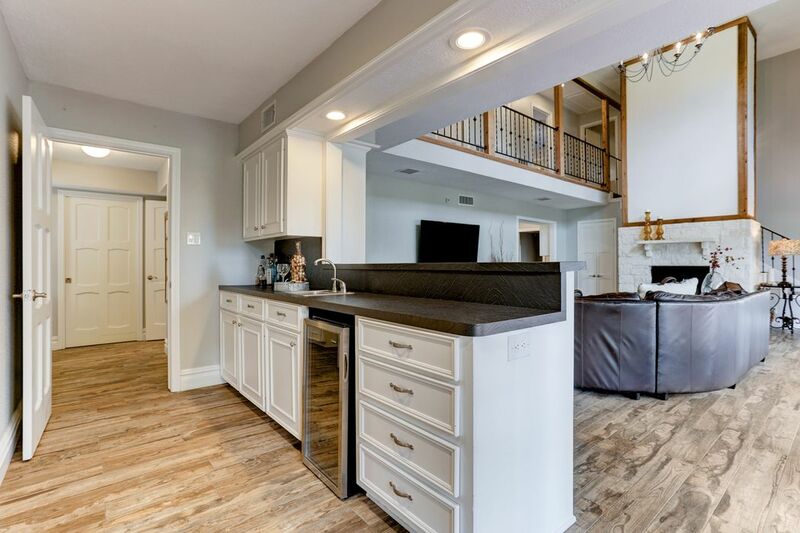 $459,000 5 Bedrooms3 Full / 1 Partial Baths4,073 sq. ft. 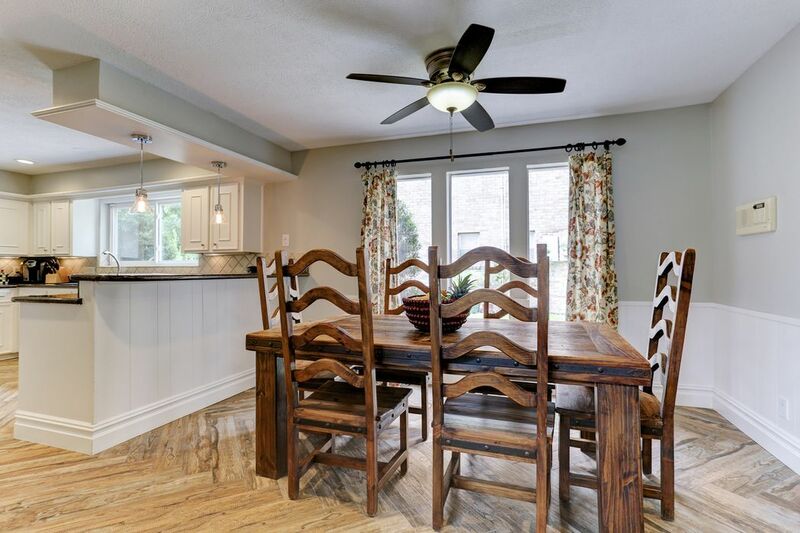 Generous 5-bedroom home in established Sugar Creek with tasteful updates abounding. 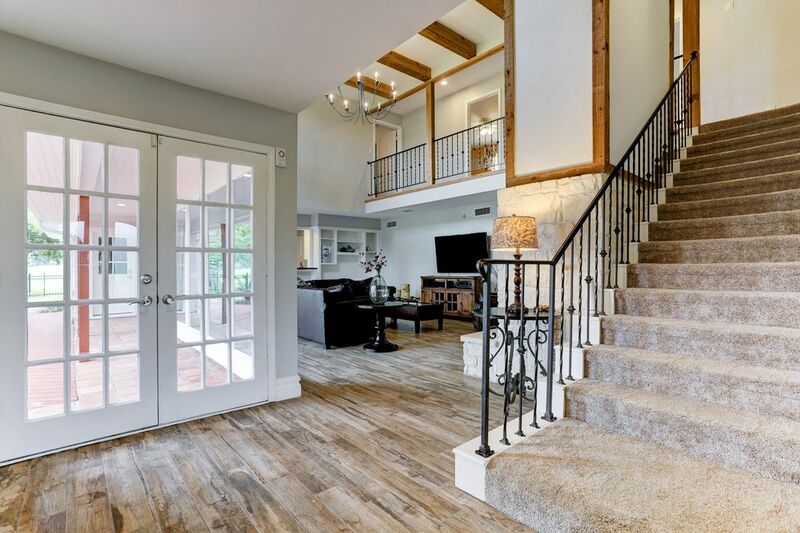 Upon entry through quality double doors, visitors are greeted by a light-filled foyer leading to dramatic living area with soaring ceiling and high end chandelier. 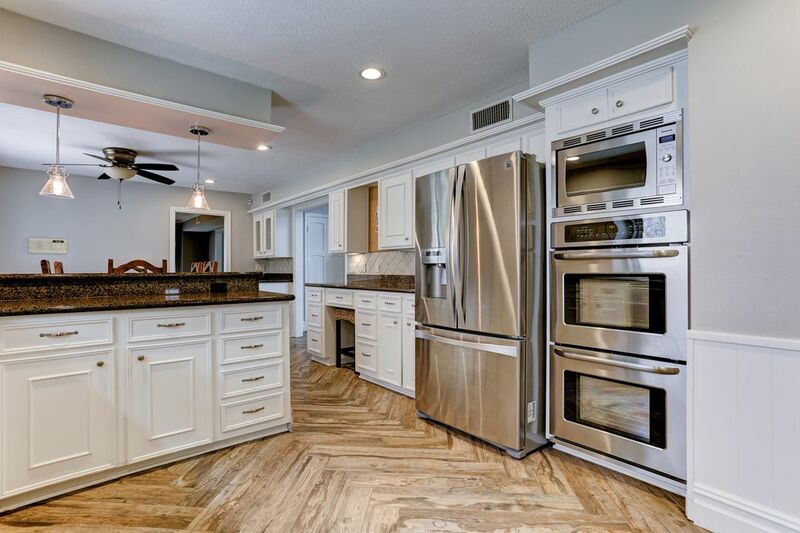 The first floor features pretty wood-look tile throughout and noteworthy herringbone pattern in the kitchen. 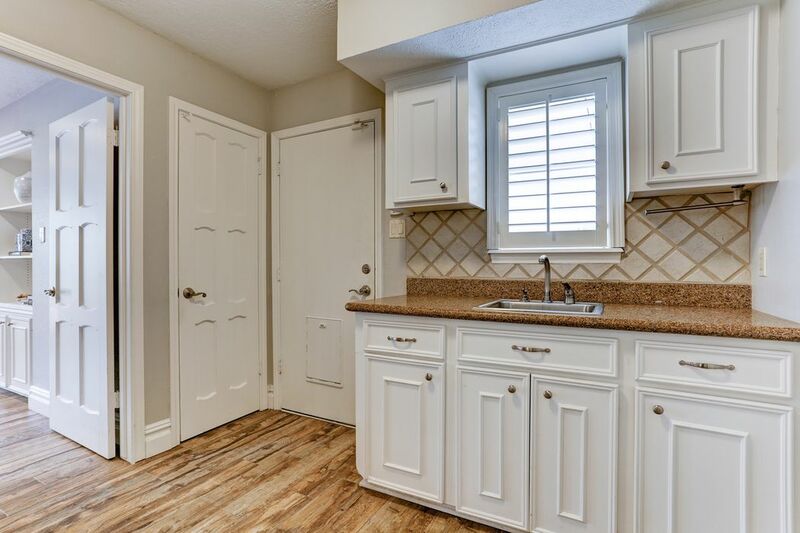 Updated kitchen features stainless steel appliances including a gas cooktop, dual ovens and a desk nook. Recent neutral paint. 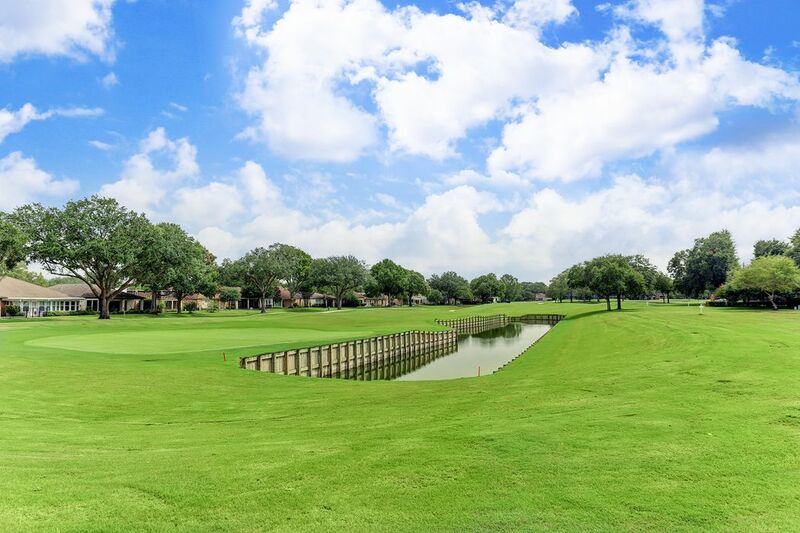 Walls of windows reveal the seventh hole tee box of Riverbend Golf Course, nestled along side the home. Out the front windows, fitted with handcrafted plantation shutters, enjoy views of yet another manicured golf course, Sugar Creek Country Club. Sleek leather like countertop adorns a sizable wet bar area with wine chiller. 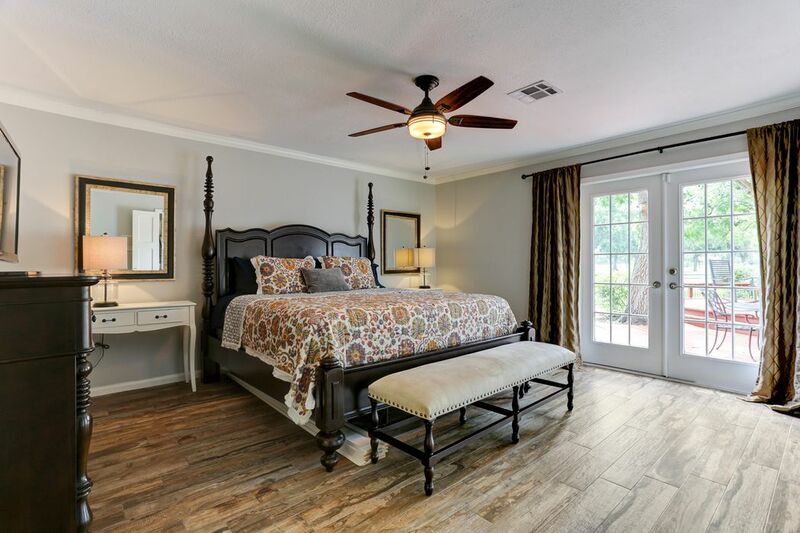 All bedrooms are large with the master having access through French doors to patio overlooking the rolling golf course. Oversize 3-car garage.